Give yourself somewhere to put down your drink in your living room by making a coffee table out of a tree slice and some hairpin legs. Continue to 2 of 99 below. Protect your table by making yourself a set of stylish marbled leather coasters to protect your coffee table from getting ring marks the next time you want to place a drink on it. Continue to 3 of 99 below. Serve up snacks at your next party on a chic marble serving tray with copper handles that is quick to DIY. Continue to 4 of 99 below. Make use of the space under your couch for storing blankets, magazines and remotes by building a storage bin on wheels that you can keep under your sofa. Continue to 5 of 99 below. Give your home some extra storage space by making some copper and wood wall hooks that are perfect to hang coats and hats in your front foyer. Continue to 6 of 99 below. Welcome your guests to your home before you have even answered the door by making this cute doormat for your home. Continue to 7 of 99 below. Treat yourself to some beautiful flowers on your desk by making a handmade patterned vase to hold the blooms. Continue to 8 of 99 below. Give your home some extra curb appeal by hanging a modern house number planter on the front of your home. Continue to 9 of 99 below. Complete your child's nursery with a modern mobile that you can easily DIY to hang above their crib. DIY Modern Baby Mobile Tutorial from Earnest Home Co.
Continue to 10 of 99 below. 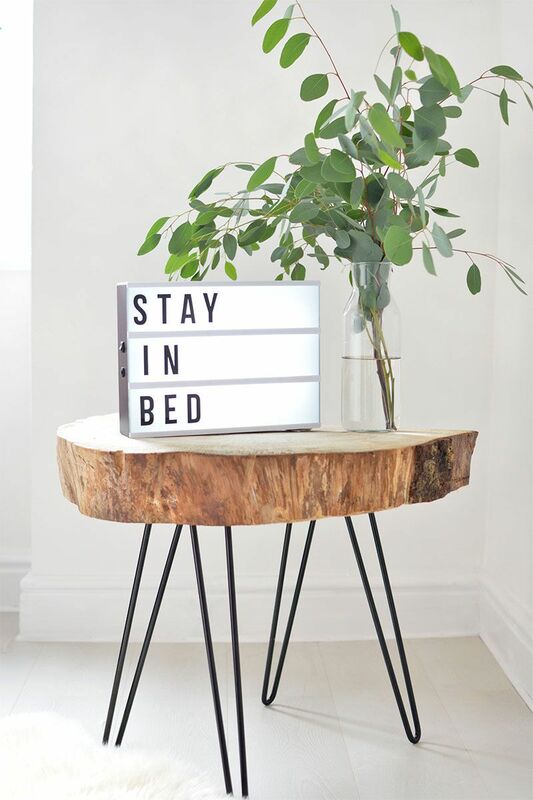 Have fun with this outstanding lightbox headboard that you can write custom messages on. Continue to 11 of 99 below. Learn how paint your own abstract painting to hang up in your home with great DIY project. Continue to 12 of 99 below. Replant your houseplant into a multicolored pot decorated with sheets of tissue paper. Continue to 13 of 99 below. Update your staircase to have an ombre design by painting the steps to gradually get lighter. Continue to 14 of 99 below. Give yourself somewhere to store all your shoes by building a shoe rack for your home. Continue to 15 of 99 below. Update your old boring office chair with faux fur to give it a new look. Continue to 16 of 99 below. Save money by allowing your clothes to dry on a handmade drying rack instead of putting them into the dryer with this clever DIY idea. Continue to 17 of 99 below. Spell out a word on your walls with some handmade faux metal letters for some affordable decor. Continue to 18 of 99 below. Add some outdoor seating with this stunning modern bench that would look perfect in your backyard or on your front porch. Continue to 19 of 99 below. Always have herbs on hand by making a herb garden for your kitchen out of recycled materials. Continue to 20 of 99 below. Give yourself plenty of extra storage space by hacking an Ikea cupboard into a sideboard for your dining room. Continue to 21 of 99 below. Skip the boring mirror and instead, try your hand at learning how to easily cut glass to make a gem inspired mirror for your home. Continue to 22 of 99 below. Build an inexpensive daybed out of plywood for some extra seating in your living room that can also work as a guest bed for out of town friends or family. Continue to 23 of 99 below. Make a cloud-like pendant for your home made out of fluffy white feathers this weekend. Continue to 24 of 99 below. Help keep your home organized with some beautiful storage boxes with gold trim. Continue to 25 of 99 below. Free up your kitchen counters by hanging your roll of paper towels underneath your counter with a DIY paper towel holder. Continue to 26 of 99 below. Add some rustic flair to your master bedroom with a dramatic bar door headboard to make your bed the focal point of your room. Continue to 27 of 99 below. Upgrade your interior doors by enhancing them with molding and paint. Continue to 28 of 99 below. Keep your dirty laundry stored in a DIY painted hamper until it is time to do the laundry. Continue to 29 of 99 below. When your fireplace is not in use keep it looking stunning by adding a faux stack of wood on the front of your fireplace. Continue to 30 of 99 below. Save money on furniture by building your own stunning table out of reclaimed wood. Continue to 31 of 99 below. Spell out your own custom message by making a trendy letter board for your home. Continue to 32 of 99 below. Light up your room with your own custom neon sign that you can easily make. Continue to 33 of 99 below. Give your cat somewhere to rest by building them a house with a soft bed inside. Continue to 34 of 99 below. Tight on space in your kitchen? Add a rolling kitchen island that can be moved to add additional counter space or a space to eat with this clever DIY idea. Continue to 35 of 99 below. Transform Ikea's Expedit shelf into a side table for beside your bed or sofa. Continue to 36 of 99 below. Give your family somewhere to sit down when they put on their shoes with a live edge walnut bench that you can DIY. Continue to 37 of 99 below. Cut a sheet of plywood into small strips of wood to make some extra seating for your home. Continue to 38 of 99 below. Affordably add some ?counter space to your laundry room by using sheets of plywood to create a waterfall countertop. Continue to 39 of 99 below. Hang your towels on a trendy lucite towel bar that you can DIY. Continue to 40 of 99 below. Update your old table using marble contact paper to give it the look of having a marble block top without spending much money. Continue to 41 of 99 below. Welcome your friends as they arrive at your home with this fun typography doormat that you can make. Continue to 42 of 99 below. Tight on space? This streamlined coat rack is perfect for hanging your coats next to your front door. Continue to 43 of 99 below. Perfect as a side table or plant stand this DIY project repurposes a cutting board into a tabletop. Continue to 44 of 99 below. Wait for the kids to arrive from school by converting their no longer used crib into a swing for the front porch. Continue to 45 of 99 below. Turn your backyard into a tropical retreat that will remind you of your vacations on the beach by building your own cabana to relax in. Continue to 46 of 99 below. Help illuminate a room in your home by assembling your own table lamp out wooden dowels and a lamp shade. Continue to 47 of 99 below. Quickly give your lamp a marble finish with contact paper with this great DIY idea. Continue to 48 of 99 below. Never run out of toilet paper in the bathroom again by always storing some extra rolls with this quick DIY. Continue to 49 of 99 below. Made out of strips of wood veneer this DIY pendant would be perfect hanging over a kitchen island. Continue to 50 of 99 below. Save money on art by making you gold confetti art with this simple project. Continue to 51 of 99 below. Stick together 2 white bowls to create your own mini planter perfect for any small plants you have in your home. Continue to 52 of 99 below. Recreate this tropical-themed art for your home with this quick DIY project. Continue to 53 of 99 below. Get the exact pattern you want for your rub in your home by using a large piece of fabric to create your own custom rug for a room in your home. Continue to 54 of 99 below. Restore your worn and stained patio chairs with a fresh coat of paint to give them a makeover that will have them looking brand new. Continue to 55 of 99 below. Discover how to make floor length curtains out of your choice of fabric which will be perfect for every window in your home. Continue to 56 of 99 below. Still lacking a headboard for your bed or the extra bed in your guest room? No problem, you can build a slatted headboard with a stylish pointed shape with this easy DIY project! Continue to 57 of 99 below. Restore your worn concrete patio by painting an eye-catching tile pattern. Continue to 58 of 99 below. It is hard to believe but this stylish fluted wall mirror is made by carving a foam sheet to create a fluted frame for a round mirror. Continue to 59 of 99 below. Keep organized by placing all your magazines within easy reach of your couch by building a magazine rack out of inexpensive copper piping. Continue to 60 of 99 below. Keep your kitchen utensils organized by building a wooden drawer organizer to perfectly fit your drawers. Continue to 61 of 99 below. Instead of a plain boring wall shelf make a leather strap shelf that is both practical and stylish too. Continue to 62 of 99 below. Make a modern looking lampshade for your home using a large sheet of paper with this amazing DIY project. Continue to 63 of 99 below. Give your house some extra seating with a handmade day bed that guests can use to sleep on when they spend the night at your house. Continue to 64 of 99 below. Maximize your closet storage space by making a spot to store everything by building your ?own closet shelving. Continue to 65 of 99 below. Perfect for small bedrooms this DIY floating nightstand can store all your essentials such as your phone or a small lamp right beside your bed. Continue to 66 of 99 below. Hide your cat's litter box by making a decorative cover to place on top. Continue to 67 of 99 below. Give a metallic finish to your headboard by covering it with vinyl for an easy update. Continue to 68 of 99 below. Never lose your keys in your home again by making a modern key holder to hang your keys after you arrive at home. Continue to 69 of 99 below. Give yourself the perfect spot to rest your book or place candles while taking a relaxing bath after a long day at work. Continue to 70 of 99 below. Update a wooden accordion rack to become a luxurious marble rack perfect for hanging your coat or hats in your front foyer. Continue to 71 of 99 below. Add some extra storage space to your living room with a coffee table made out of plywood that has a section underneath perfect for storing small items. Continue to 72 of 99 below. Give yourself somewhere to store your bottles of wine on your kitchen counter with a modern copper and leather wine rack. Continue to 73 of 99 below. Make use of your front porch by giving your family somewhere to sit and relax outside with a West Elm inspired outdoor bench. Continue to 74 of 99 below. Get ready to entertain in your backyard with an outdoor serving station that can be used to serve drinks and be closed and hang against the wall when not in use. Continue to 75 of 99 below. Instead of replacing your plain white curtains update them with paint to have some bold stripes to give them a fresh look. Continue to 76 of 99 below. Bring the outside in with a wonderful tree stump side table that would look amazing beside your couch. Continue to 77 of 99 below. Keep your drink within reach by placing it on a table that can fit on your sofa's armrest. Continue to 78 of 99 below. Finish accessorizing a console table, desk or bookcase with some Pottery Barn inspired sculptures that you can make out of embroidery hoops.? Continue to 79 of 99 below. Just because you are renting does not mean you cannot decorate your home. Try updating your stairs to give it some more personality by adding removable wallpaper. Continue to 80 of 99 below. Carve your own stamp out of a potato and use it to stamp your design on a blank pillowcase for custom accent cushion for your couch. Continue to 81 of 99 below. Keep your home organized from the moment you arrive home by giving your family somewhere to hang their coats and store the mail with a wall mounted rack. Continue to 82 of 99 below. Quickly find the spice you are looking for while cooking by making an organizer for your spice drawer in your kitchen. Continue to 83 of 99 below. Ditch the standard toilet paper holder and DIY something more chic for your bathroom instead. Continue to 84 of 99 below. Bring in the flowers to your home with some cheerful DIY floral curtains that you are sure to adore. Continue to 85 of 99 below. Wrap one of your old lampshades with yarn to give it a fresh look with this simple DIY project. Continue to 86 of 99 below. Give a spa-like feel to your bathroom with a luxurious DIY cedar bath mat. Continue to 87 of 99 below. Make the perfect side table for your front hallways with this clever hack for your Ikea Svalbo table. Continue to 88 of 99 below. Instead of a traditional credenza DIY a floating one to store all your extra dishes using Ikea cabinets. Continue to 89 of 99 below. Raise your cat or dog bowls off the floor so it is easier for them to eat their food with this modern DIY bowl stand. Continue to 90 of 99 below. Update one of your old blankets by adding cute DIY pom poms around the edge. Continue to 91 of 99 below. Recycle an old tire by turning it into a coffee table perfect for your patio. Continue to 92 of 99 below. Skip the hassle of hanging wallpaper and draw on your walls to give the look of a wallpaper with a gold leaf pen. Continue to 93 of 99 below. Use some acrylic paint and a paintbrush to paint a dip dye design on a pillow with this DIY project. Continue to 94 of 99 below. Hate the color of one of your old vinyl chairs? Learn how to change the chairs color with paint with this clever DIY. Continue to 95 of 99 below. Wrap thin strips of vinyl in any color around your lampshade to give it a striped finish. Continue to 96 of 99 below. Keep your patio table umbrella from falling down by making a base out of a pot and rocks to hold it upright. Continue to 97 of 99 below. Go tropical with a bright and cheerful doormat that would be perfect for your front door! Continue to 98 of 99 below. Have tons of extra seating available for the next time you have a party by making some fun donut stools for everyone to sit on. Continue to 99 of 99 below. This weekend try updating one of your plain rugs by painting a chevron design on it.